That the winner this time is not from among the so-called fab four is in itself worth celebrating. That it was a defensive masterclass in an era of attacking batting makes it even more cherished. 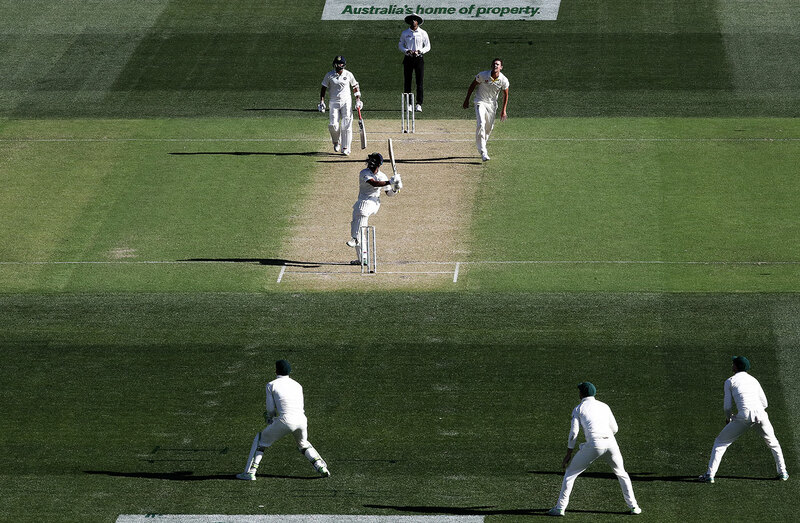 Pujara's 123 on the first day of the series against Australia had an impact far greater than on just the Adelaide Test. It set the tone for the series; India batted more doggedly and drove Australia's bowlers into dust. Pujara came in to bat at the end of the second over, watched all his batting team-mates perish to anxious attacking shots, but refused to give in. He kept his mind in control, waiting for some support at the other end, which arrived in the form of R Ashwin at 127 for 6. Pujara waited, waited and waited for the loose ball, while keeping the good ones out, of which there were plenty. Only when Ashwin got out did Pujara begin to play attacking shots to even good balls. Pujara was on 89 and India were eight down for 214 when Australia failed to review a caught-behind appeal. Replays showed the decision might have been overturned had Australia asked for the review. The shot Pujara had tried was indicative of the batting to follow - a hard cut to a ball not quite there for it. Pujara was about to switch gears. He has done so several times when batting with the tail, but still manages to leave observers surprised with every new assault. A hooked six, an upper-cut six, refused singles to manipulate strike, and 34 runs off the last 18 balls he faced. It took India to 250, which gave them a 15-run lead and a 31-run win. 53 Number of balls Pujara left alone, 23 more than all India's other specialist batsmen put together. 1 This was Pujara's first century in Australia. 1258 Number of balls Pujara ended up facing in the series, the fourth-highest for any batsman who played a maximum of four Tests in a series. "It is one of my top innings in Test cricket, I could say top five. The way the team-mates appreciated it, they were saying it was one of the best." Australia had won the first Test and won the toss in the second, but underachieved slightly to make a total of 243. However, South Africa were precariously placed at 183 for 6, having lost four wickets for 28 runs. De Villiers was only on 18, but a typical counterattack followed, pushing Australia out of the Test and the series. New Zealand were behind by 74 on the first innings and had lost four wickets even before wiping away the deficit, but they had their captain, Williamson, still standing. He stood there long enough, scoring 139 pristine runs in the company of Henry Nicholls and eventually left New Zealand in a position where they could declare the innings and force a famous Test win.